Teotenango is located at the southern end of the Toluca Valley. 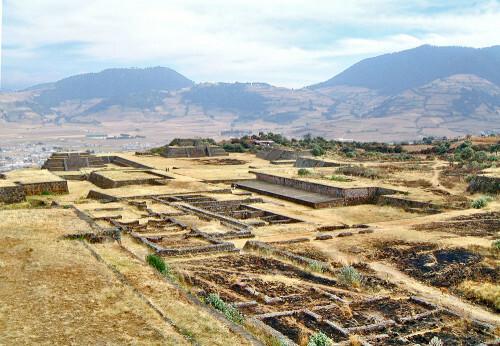 Situated on the altiplano, 2500m above sea level and at the heart of the Trans-Mexican Volcanic Belt, the Toluca Valley’s fertile volcanic soil and an eternally cool sunny climate provided an ideal environment for agriculture with the first signs of human occupation dating back to 12,000BC. With the advent of trade, the valley also became an important route for moving goods from the west coast to the central highlands and from the southern lowlands to the north. During the Late Classic Period, between 500AD-900AD, a number of cities rose to prominence within the Toluca Valley, including Teotenango, Calixtlahuaca and Malinalco, all of whom were capitalising on a trade network which ran the length and breadth of Mesoamerica. Teotenango’s history begins on the valley floor to the north of the Cerro Tetepetl in around 650AD. This early period is known as Stage 1 and the township, named Ojo de Agua, is thought to have been built by a group peoples known as the Otomi. 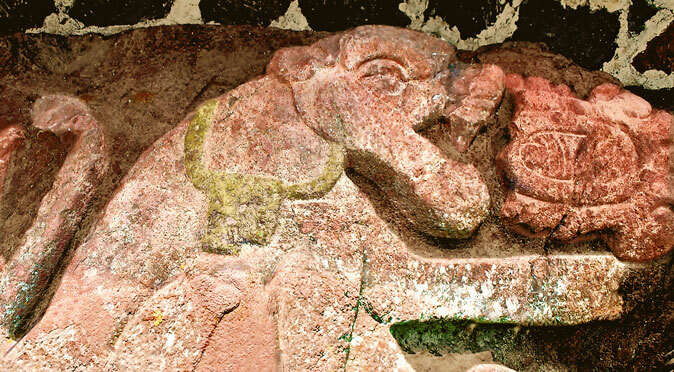 The Otomi occupied much of the altiplano during this period and are most likely to have founded the settlement, however, pottery samples excavated at Ojo de Agua show a strong Teotihuacano influence. 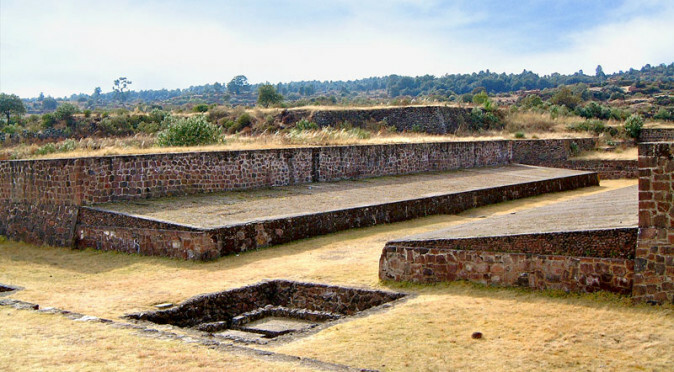 The founding of Ojo de Agua coincides with the period Teotihuacan is thought to have been abandoned, possibly following a continued drought, and it is possible that the construction of Ojo de Agua was undertaken or assisted by people migrating from the failing megalopolis of Teotihuacan. W0013TO: Looking East to Plaza’s A and B and the horizon beyond Stage 2 of Teotenango’s history begins in around 750AD, when the construction of a ceremonial centre high upon the eastern side of Cerro Tetepetl (Tetepetl Hill) began. This side of the hill was probably chosen so that the ceremonial buildings could be aligned from east to west with uninterrupted views to the eastern horizon and the sunrise. Many hills were considered sacred places by the ancient Mesoamerican people, however the choice to build upon them has often proven to be for the purpose of celestial observation. To track celestial motions, people needed to be able to mark the horizon, and although the arid valley floor has perfect views now, it is likely that it was densely forested during the 8th century and so a better vantage point would have been essential. This observational function is alluded to on the foundations of the main group, where a carving of a jaguar is found accompanied by two date glyphs. W0019TO: Jaguar CarvingThe carving is believed to be contemporaneous with the foundations and features a jaguar with a flower or a bleeding heart in its mouth. It is believed that the jaguar symbolises a celestial body (such as the moon or constellation), which was seen in the sky consuming another celestial body (such as the sun or a planet). The nocturnal jaguar is known to have symbolised the moon, which suggests the event is a solar eclipse. The date glyphs are believed to describe when this event happened and possibly coincided with the founding of Teotenango’s ceremonial complex. To build the ceremonial complex, the people of Teotenango needed to artificially flatten, terrace and fill the ragged, volcanic terrain of the Cerro Tetepetl. To undertake a building project of this magnitude, just 100 years after founding a simple town on the valley floor, adds further credence to the theory that there was an influx of people arriving in the valley who brought skilled labour and engineering expertise with them. With a Teotihuacano influence found amongst the sloping walls of the adobe structures built in Stage 2, it seems certain that people migrated from Teotihuacan to become a fundamental part of Teotenango’s rapid construction. Archetypical Teotihuacano construction techniques were also echoed in the architecture of the pyramidal bases of Group A and Group B, which were constructed during Stage 3 (see fig. W0013TO). W009TO: Looking across Teotenango’s main ceremonial complex, built during Stage 3Stage 3 of Teotenango’s history took place between 900AD and 1162AD and witnessed the construction of the majority of the ceremonial structures that are visible on the Cerro Tetepetl today; this includes the Ball Court, the base of the Grupo de la Serpiente, and the three pyramidal bases found in Groups A and B (almost everything that is visible in fig. W009TO). It is thought that Teotenango started to expand northwards through the valley during Stage 3 and this may reflect the expansion of trade networks, with goods being supplied from coastal and southern regions to new cities to the north and central highlands. In fact, Teotenango’s expansion may have been inspired by trade, with people arriving from Teotihuacan to rebuild there merchant lifestyles. Regardless of Teotenango’s origins, the abandonment of Teotihuacan meant there was a vacuum that needed to be filled and new cities such as Teotenango could instantly take advantage of an existing trade network. The early inhabitants who built Teotenango are known as the Teotenancas, Teutenancas or Teotenaca, and the name of their city translates to “Place of the Sacred Walls” – this is derived from three Nahuatl terms:- “Teoltl”, meaning divine or sacred; “Tenamitl”, meaning walls or barricade; and “Co”, meaning place or within. 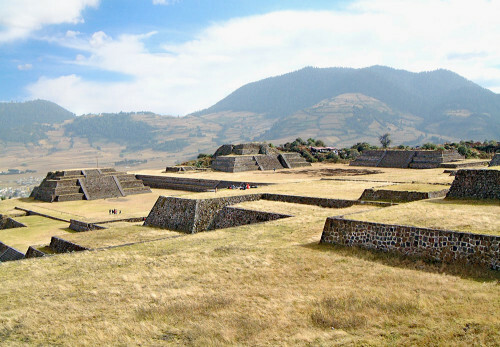 Interestingly, the Chronicles of Chalco-Amaquemecan state that the city was called “Walled Place of the Buzzards”, or Cozcuauhtenanco, and was named after the Teotenanca-Matlatzinca warriors who manned the fortified city. The Matlatzinco are thought to have conquered the city during the 12th century and marks the beginning of Stage 4, which stretches from 1162AD and 1476AD. 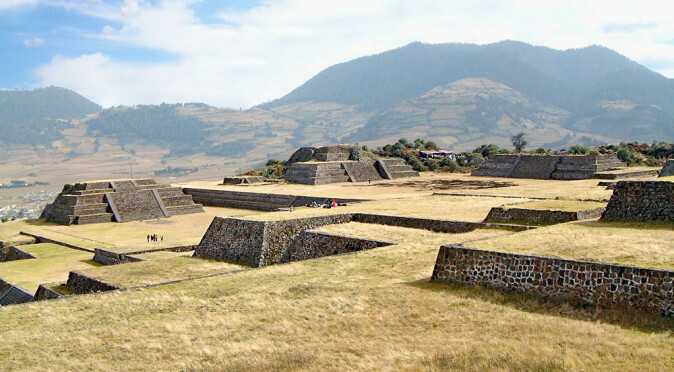 During Stage 4 the Matlatzinca turned Teotenango into a fortress by adding defensive walls around the city and in particular along western perimeter, where the walls reach a height of 10m with a thickness of 1.5m. The Matlatzinca burned down a number of buildings to create space for residential areas to the south. Ojo de Agua, on the Valley floor, was abandoned by this time and so the fortified hilltop site became a self contained city. The conquest of Teotenango by the Aztec under the command of Emperor Axayacatl in 1474AD marks the beginning of the final period of its history, which is known as Stage 5 and extends from 1474AD until 1550AD, when the city was abandoned. The Aztec did little to develop the site on the Cerro Tetepetl and after the Spanish arrived the population was moved down the hill to a new colonial village named Tenango de Ville, with Tenango de Vista being founded in 1582AD. Located high upon the Cerro Tetepetl in the Toluca Valley, Teotenango is both magnificent and serene, with its immense architecture and spectacular views. Looking out over the vast valley below, to the mountainous horizon of the east, are Groups A and B and their respective pyramids, which may have a hidden history and purpose. 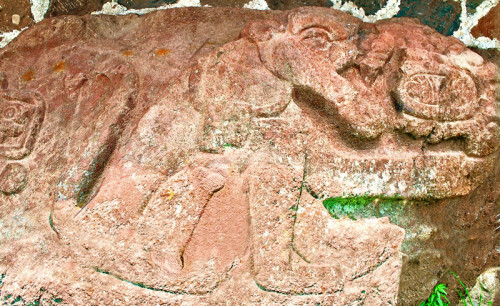 The mysterious carving of a jaguar devouring a heart is carved prominently on the wall next to the entrance to Teotenango and was designed to be seen by all entering the city. 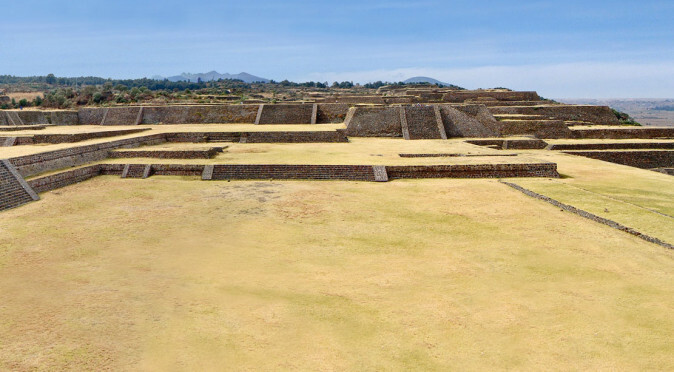 Measuring 53 metres in length, Teotenango's ball-court is quite substantial, which demonstrates the game was an important part of life (and death!). 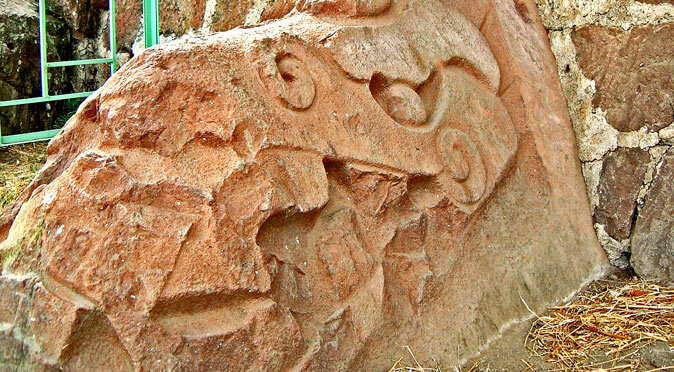 A giant carving of a serpents head protrudes from the eastern wall of the Grupo de la Serpiente, which may indicate a celestial purpose to Structure 2D.